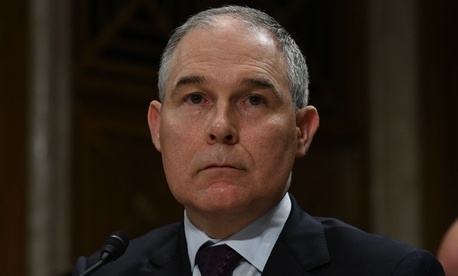 Former Environmental Protection Agency Administrator Scott Pruitt doubled spending on his security detail compared to his predecessor, according to a new audit, and failed to justify the increase. EPA’s decision to provide Pruitt with protection 24 hours a day, 7 days a week broke from recent precedent in which the agency's head received a security detail only when in transit, the agency’s inspector general said. Pruitt’s predecessor Gina McCarthy had six agents on her detail, spending $1.6 million on security in her final 11 months. Pruitt had 19 agents on his detail and spent $3.5 million from February through December 2017. The spending surged because of both the added security levels as well as the higher costs associated with Pruitt’s first-class travel. Additionally, the IG only provided that report in August 2017, six months after Pruitt came on board and began receiving the added security. “The increased costs associated with this undocumented decision represents an inefficient use of agency resources,” the IG said. Pruitt resigned in July amid a mounting list of scandals, of which spending on security was just one. In a resignation letter, Pruitt said the “unrelenting attacks” on him and his family had taken a “sizable toll.” A week after his resignation, the IG said, acting Administrator Andrew Wheeler canceled the 24/7 protection in favor of the standard door-to-door security. "It seems like someone inside the EPA thought it was a good idea to expand the administrator's protective service detail without any legal advice or oversight," said Scott Amey, general counsel for the Project on Government Oversight. "The report highlights a high level of dysfunction within the EPA and the result is taxpayers got stuck paying an excessive million security bill to protect Pruitt." EPA management repeatedly told its IG that it had no documentation to support the initial decision to provide Pruitt with 24/7 security, nor did it have any “documented evidence or justification” to continue it after what was initially intended to be a two-week trial period. Additionally, EPA’s Office of Homeland Security “did not identify any specific threats against Administrator Pruitt,” the IG said. The auditors recommended EPA complete a threat analysis for the administrator and use it to justify its level of protective detail, but the agency rejected the suggestion and said “a lack of threats does not mean there is no risk.” The IG said EPA maintained no legal basis for providing the administrator with security at all, but the agency’s general counsel issued an opinion to assuage those concerns after the auditors provided it with a draft of its investigation. EPA also improperly paid overtime in an array of cases, leading to more than $100,000 in improper payments over a 13-month period, the watchdog found. The agency took some steps to address the IG’s concerns, but did not agree with all of its recommendations.